The second large scale Israeli public transport infrastructure project is now feeling the heat of BDS campaigners. The Israeli light rail project in Jerusalem has been since years targeted by BDS activists that support Palestinian calls for boycotts and divestments from companies that participate in this project, which links Israeli settlements to West Jerusalem and strengthens the Israeli grip on the occupied eastern part of the city. After hearing of Brazil's recognition of Palestine in 2010, a Palestinian youth flies the Brazilian flag during a confrontation with Israeli forces. The Norwegian Government Pension Fund Global (GPFG) has divested from two Israeli companies, Africa Israel Investments and Danya Cebus, over their involvement in construction of illegal settlements in the West Bank. A government statement quoted the Norwegian Minister of Finance Sigbjørn Johnsen as saying “these companies are contributing to or are themselves responsible for grossly unethical activity.” This decision follows the Norwegian Ministry of Finance’s move one year ago to exclude Israeli military contractor Elbit Systems Ltd.
Stop the Wall releases two reports on Brazil's complicity with Israeli wars and occupation. 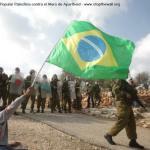 Stop the Wall has issued today a briefing 'Brazil’s economic and military relationship with Israel' asserting that - if Brazil continues along its current political path -, it will effectively close off every possibility for the country to be an agent of just peace whether in the region or in the Middle East. Two Danish investment funds divested from Wall and settlement building companies, marking another victory in the BDS campaigns against Africa Israel and Elbit, two companies that have been targeted by BDS activists. In particular, this a critical step in the BDS campaign against companies building the Wall, opened by the Norwegian divestment last year. The new Campaign flashpoint presentation is a unique tool for activists to introduce Boycott, Divestment and Sanctions campaigns to their communities. Civil groups, institutions and campaigners will find it an invaluable tool for creating and supporting their initiatives. The presentation reveals the rationale, aims and arguments around the move to isolate Israeli Apartheid and explores the various forms actions can take. This week the World Council of Churches (WCC) joined an ever expanding movement across the Christian World and condemned the “illegal” Israeli occupation of the West Bank and Gaza while highlighting plans to apply “economic pressure” on Israel. Reminiscent of the Anti-Apartheid boycotts which rocked the racist regime of South Africa during the 1980s, the WCC meeting in Geneva this week noted Israel’s Colonization of the West Bank as “illegal activities … as if a viable peace for both peoples is not a possibility”. Recently the Ireland Palestine Solidarity Campaign called for a Boycott of Israeli potatoes, fruit, and herbs being sold in supermarkets throughout Ireland. The IPSC writes: "In South Africa, an international boycott was key in ending apartheid. You can help defeat the brutal apartheid system that Israel is imposing on the Palestinians. Our governments have failed to act, so it's critical for individual people to take action in solidarity with Palestinians."